Our girls have longer hair but it is so fine. Pony tails and pig tails seem to last about 20 minutes before the hair starts creeping out and looks messy. We saw the teens at the park wearing bandanas to keep their hair back and the oldest commented that she thought they were cute. So, what to do but give them a try. They worked so well we have now made them to co-ordinate with many of their summer outfits. 1. 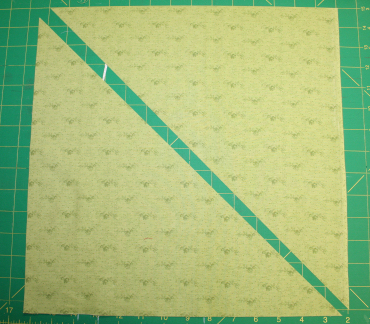 Cut the fabric square in half on the diagonal (you can make two from each 14" square). 2. 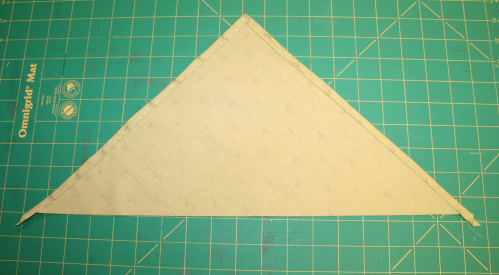 With wrong sides together fold and press one short side in 1/4". Fold in and press in 1/4" again enclosing raw edge. Sew close to the inner edge. Repeat for the other short side. 3. Hoop and embroider the design as desired. I used a printed template pinned in place. 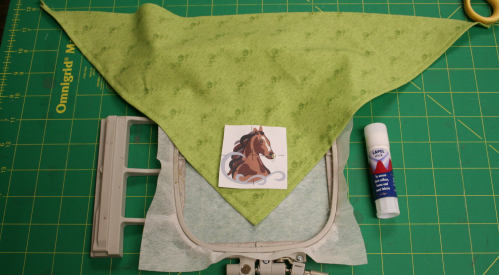 Hooped tear away stabilizer and then used my Lapel Stick to hold the bandana in place on the stabilizer. I love my Lapel Stick for sticking cotton on top of the hoop. I do lots of applique and little items that cannot be hooped. It works great for me. 4. Clip the extended corners. 5. 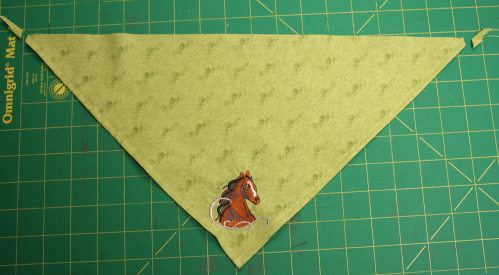 With wrong sides together fold and press long side in 1/2". Fold and press the corners in 1". 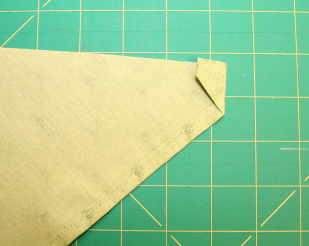 Fold and press the long side in 1/2" again enclosing the raw edges. Note: At this point you might want to wrap it around the child's head to see if you will need to make any adjustments to the elastic insertion. 6. 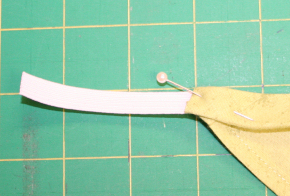 Insert about 1/2" of the elastic end into one end of the fold and sew it down. 7. 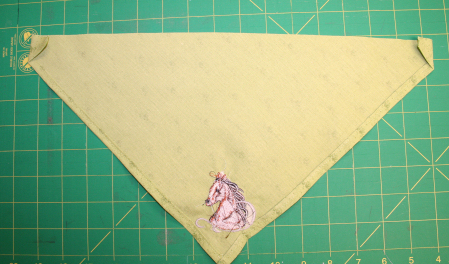 Sew along the inner edge of the long side stopping about 3/4" from the end. Insert the other end of the elastic into the fold. 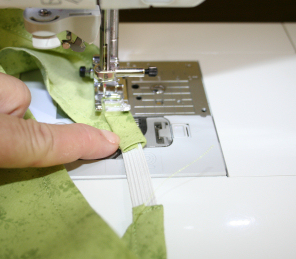 Finish sewing the seam. 6. 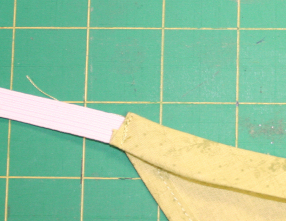 Sew along the end where elastic was inserted. 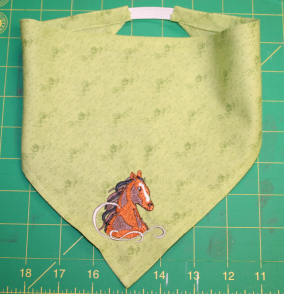 My eldest granddaughter is horse crazy so we used a little horse head from SWN Wild Horses collection on this one. Any small design will work so you can make each one unique and special. Emma wore one last week to a church gathering and now all the girls in my Sunday school class want one. Have fun with all your summer projects. Oh my gosh, how cute are these! They look like terrific party favors for sleepovers & stuff!! Thanks for such a CUTE idea & a great tutorial! These are so cute I just had to make my older daughters each one. I cut the square 16 inches like the pattern says for an adult but they are way too small. I think I will now have to go to a 20 inch square.